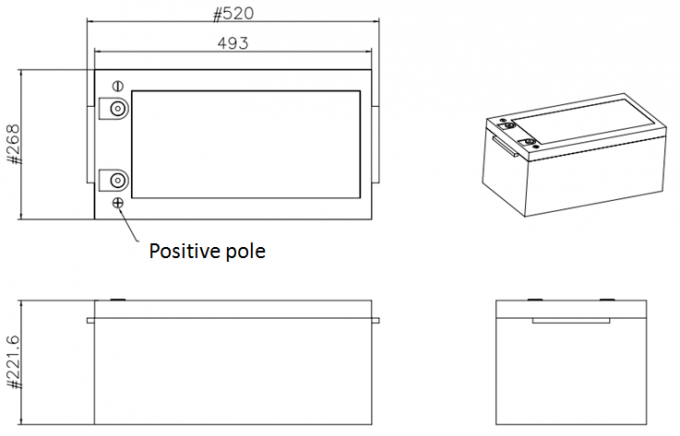 This specification defines the performance of rechargeable LiFePO4 battery pack TB-BL12300F -S107A_HEAT manufactured by SHENZHEN TOPBAND BATTERY CO., LTD, describes the type, performance, technical characteristics, warning and caution of the battery pack. The battery pack supports Bluetooth communication function. Through Android and IOS APP, it can read the battery status and information. Especially due to the Android system’s openness, different smartphone manufacturer will have their own different Bluetooth hardware version and customized feature Android systems. So the APP may not work well on some smartphones (with Android system) due to the compatible issue. It is necessary for the customer to confirm whether the phone is compatible with the APP. If the battery need be stored for a long time, the voltage should be 13.2V (50%SOC) and stored in the condition as storage proposal. It needs at least one charge & discharge cycle every six months. 3.1.3 Unless otherwise specified, the tested product is required unused within two months after outgoing. "Quick Charge" means at 25±2℃ charge to limit voltage with 0.5C constant current, then charge with constant voltage until current less than 0.02C. "Quick Discharge" means discharge with 0.67C current withstand 30 mins. 4.1 Rated Capacity 300Ah Rest for 1 hour after fully charged, then discharge with 0.5C current until the battery reaches the discharge cutoff voltage. Repeat above process for three times, if the discharge time is not less than 120 minutes, you can stop and define the Discharging current*time value (Ah) as battery capacity. 4.8 Bluetooth communication Through APP, the user can read the battery system information such as voltage, current, SOC, temperature, etc.